The concert will feature trumpeter Jacob Wick, who’s playing a series of concerts in the Southeast around then. Jacob is an artist, writer, and improviser with musical connections to the communities in New York (including Jason Ajemian’s avant-party High Life), Chicago, and the Bay Area. He lives in Mexico City. Information about Jacob is at www.jacobwick.info . 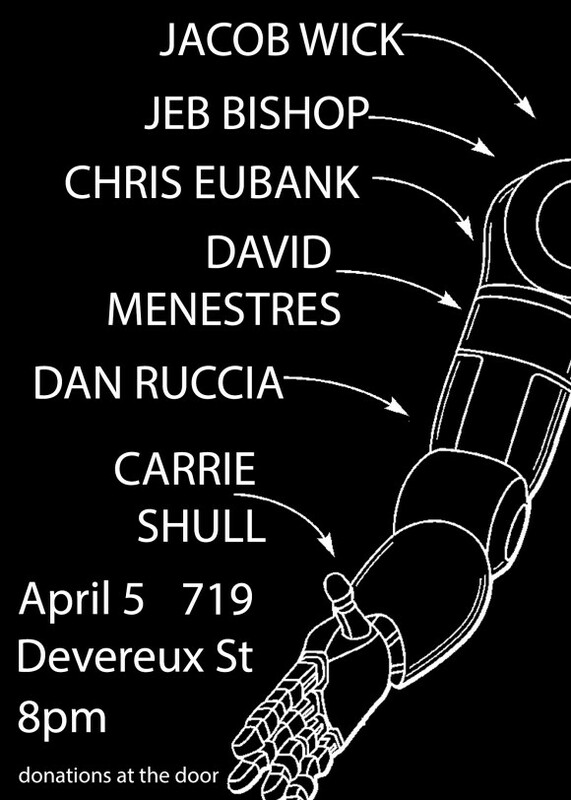 For this concert, Jacob will play a solo set, followed by a set with area musicians including Jeb Bishop, Dan Ruccia, David Menestres, Chris Eubank, and Carrie Shull. The concert will start at 8 PM, and there will be a jar for voluntary donations. Feel free to bring your own beverage. Dan Lilley’s home is a beautiful and unique setting for live music, and we are lucky and grateful to have the chance to present these concerts there.